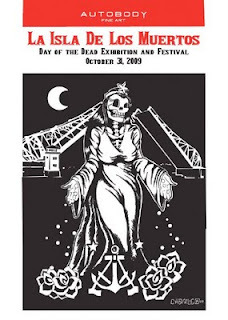 Tomorrow, October 31st, I will be participating in Las Isla de los Muertos in Alameda.This is a wonderful festival, organized by Amy George of Autobody Fine Art. A festival full of sights, sounds and smells of this beautifully sacred holiday, featuring traditional food, crafts and activities. Sugar skulls, laughing skeletons and hallowed offerings will envelop. Please join us on this special day and share your stories and experiences with your community. If you live in the area, I hope you can stop by. All are welcome to come share in this wonderful community event. 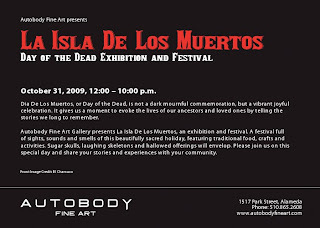 I will be showing some of my most favorite Calavera artwork and gifts! Saturday, October 31, 2009 / 12-10 p.m. I'm half asleep while writing this. I'm actually nodding off while typing. Guess I'm tired. Its been a busy time for me. 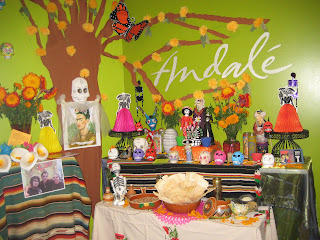 Yesterday I had the pleasure of creating my second altar for Andale - a Mexican restaurant on the Google Campus in Mountain View. The space I worked in was small but it was so much fun creating and working within a given area. The basic idea for the altar was a Tree of Life dominating the background of the space. I placed paper marigolds on the tree to appear as if they were growing from the tree. At the base of the tree grew the altar with a plethora of calaveras, diablos, food, marigolds and sunflowers. All in all, the outcome was great and everyone at Andale seemed to enjoy it. My husband Gary helped me so much putting it together. After all these years of setting up shows, we actually work well together. In the past, we always had separate views on what worked. We were like a dinosaur with two heads - each trying to move in the opposite direction. These days we seem to be more of a team. What a relief!!! Hope you enjoy the pics! Please click on the title to view the video Gary made. 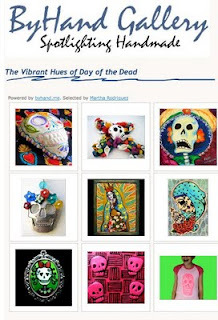 Vibrant Hues of Day of the Dead featured on By Hand Gallery Blog! 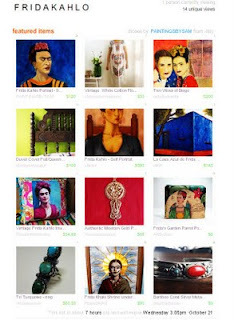 The spotlight I created featuring the work of some of the artists on the Day of the Dead Market on 1000 Markets, has been featured on the By Hand Gallery blog. It looks great along with other wonderful spotlights created. Please take a look and look around the By Hand Artisan Co-op! 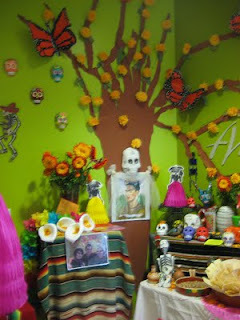 We are nearing the fabulous season of Dia de los Muertos. In honor of the fabulous artwork that represents Day of the Dead, I decided to once again highlight some of the artwork created on the Day of the Dead Market on 1000 Markets. This spotlight highlights a new group of artists not previously seen on the The Vibrant Hues of the Day of the Dead spotlight. Hope you enjoy round 2!! Last night I was up too late (AGAIN!) 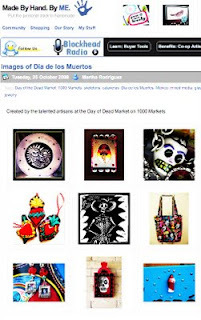 and decided to create a Day of the Dead spotlight with my fellow members of the Day of the Dead Market on 1000 Markets. I decided to title the spotlight The Vibrant Colors of Day of the Dead. 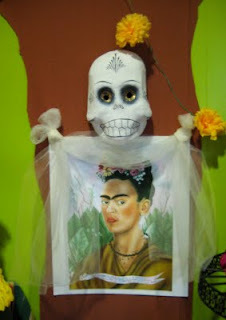 It seemed like an appropriate title since the mood of Dia de los Muertos is a happy, vibrant, celebratory one! After reading through my post yesterday, I realized I hadn't mentioned the work I've been doing away from Etsy and 1000 Markets. Well sales at Open Studios and other venues have been moderate but steady. Geez, I sound like I belong on the Stock Exchange!! Anyway, people have been buying some of my work at the events I've done so this makes me happy. Fortunately, I don't just depend on my online sales to make money. All is okay this Monday morning. So many good things happening without many online sales! With all my posts on Facebook,my Twittering,blogging and on and on, I think I am getting my work and name out in cyberland. 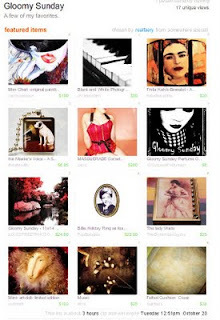 Within the last 3 days, I've been featured on 3 Etsy Treasuries. After months of very dry spells and what felt like no recognition anywhere, this happens. I'm in a state of shock! I am ALWAYS grateful to Indie Spotting for posting the work I send in on their Indie Finds. This is so helpful in promoting my work! Today, I also got an email from the Staff Picks Department at 1000 Markets that said my Frida's Menagerie Tray was chosen as one of the staff favorites. Unbelievable!! Well this is all really, really good stuff. The interesting thing about all of this wonderful PR is that I haven't had any Etsy sales in about 2 months. What do I think about this? Well, I know my designs are very specific. Not everyone is going to go for them. I also know my prices are not bargain basement on many things so sales take longer. I also rarely mark down prices or offer specials. So, in the end, my conclusion is that it takes lots of promotion to get people to notice me and for them to actually decide to spend their hard earned money. This reality does not make me angry, frighten me or cause me to close up shop. Again, these times require you to work harder at what you do in order to make sales that a few years ago were much easier to make. This seems to be a fact that I've had to face. Its a challenge and I'm facing it. Don't know how other small independent businesses are surviving or how consumers see spending their income. Would be really interested however in hearing from you. Well its been busy allright. Finished Open Studios last weekend and last night I did the opening reception for the Dia de los Muertos event ALTARS FOR THE SPIRITS/OFFERINGS FOR THE LIVING at SOMARts in San Francisco. What a great experiences doing both these events. Its clear people are struggling financially but the positive nature of the crowds taught me something. 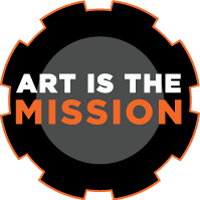 I think that despite hard economic times, people want to go out, be entertained, enjoy art and spend a little money. 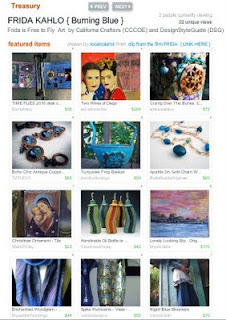 The items I've sold more of have been magnets, earrings an occasional home accessory and handbag. Art - like paintings - is the most difficult. I have however, had more people admire the artwork I do. This leads me to believe admiration will turn into sales at a later date. For those of us that can hang on, this is doable. Its not easy but you have to become very creative in how you make your money. These are tough times but I feel very hopeful!! So, in the meantime, I wanted to mention that my Frida's Menagerie Tray was featured on Indie Spotting. Please take a look. You can always view it on Etsy where you can even buy it if you'd like! p.s. By the way....I could still use your vote. 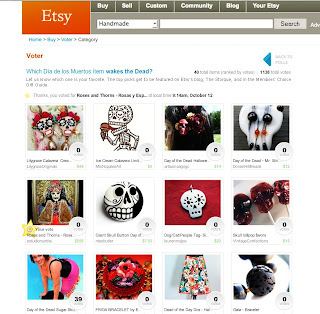 Voting on the Etsy Voter titled, "Which Dia de los Muertos item wakes the dead," closes on 10/19. My Roses and Thorns painting could use your vote!! THANKS and many more thanks for your vote!!! Roses and Thorns listed on Etsy Voter!!! 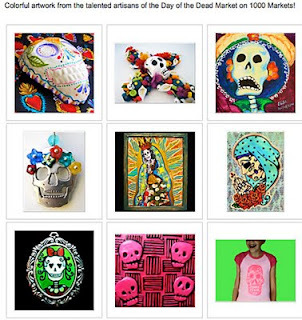 I was notified by my friend Marianne Butler of Miss Butler's Style that I had been included in an Etsy Voter titled, "Which Day of the Dead item wakes the Dead." What a surprise!!! I would so love it if you could lend me your vote!! The winner is featured on Etsy's Blog, The Storque and in the member's choice gift guide. Wow...this is a big deal and absolutely great promotion. Check out our fabulous artwork on our studio website!! My studio is an enormous mess right now!! Why you ask? Well, in anticipation of Open Studios at 1890 Bryant plus at other buildings throughout the Mission, I have been creating lots of new work! New work involves lots of supplies. If you walked into my studio today, you'd find tubes of paint scattered about and piles of hand made paper of various colors and texture thrown on a table. On another table you'd find an assortment of fabrics in spectacular prints. If you turned around you'd see my jewelery making supplies: beads, chains and findings. Its a mess inside studio 318!!! By Friday at 6:00, you will find an altogether different scene. 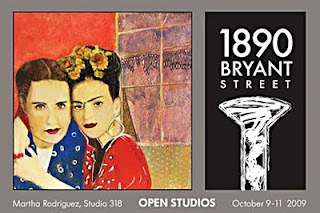 Studio 318 will become Estudio Martita!! Inside you will find wonderful new mixed media work ranging from a new Dia de los Muertos Series, Frida Kahlo images, Tina Modotti images and some great new additions to the Thick Girl Series. 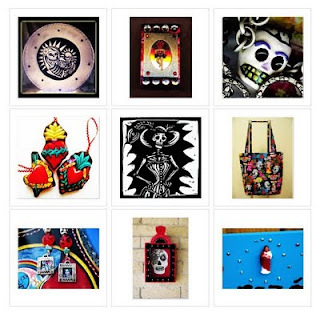 Add to that some fabulous new upcycled handbags adorned with Frida, calavera and Ranchera images. Add a few home accessories to the mix and last but not least there will be new jewelry adornments made from vintage beads. So much to see with plenty of time to peruse!! 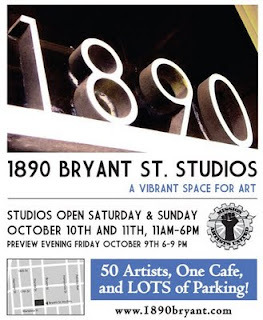 Saturday and Sunday October 10th and 11th from 11 to 6pm. 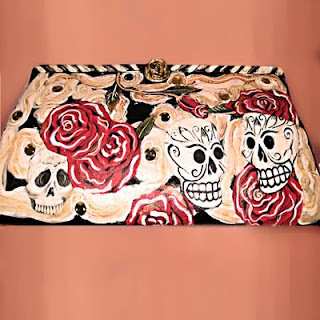 Calavera & Roses clutch purse listed on Indie Spotting! 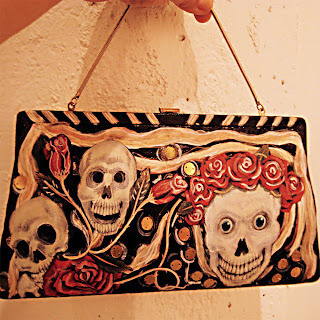 The wonderful staff at Indie Spotting, just posted my Calavera and Roses vintage clutch. HOORAY!! Indie Spotting as part of MY SHOPPING CONNECTION is a resource for people who love shopping for interesting, unusual or one-of-a-kind items from online and local sources. Their aim is to provide useful and interesting resources to help you make the most of every shopping experience. Its a great place to shop! 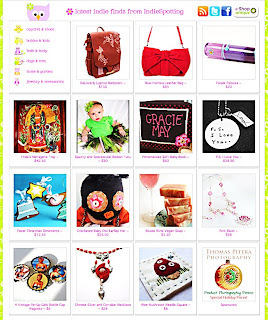 So....here's the link - including my Calavera and Roses purse!